Professor Ellis joined UC Berkeley's Department of Architecture in 1970, where he taught, researched, and innovated in the intersection of sociology and architecture. He subsequently played a significant role in university administration, serving as Vice Chancellor of Undergraduate Affairs and Faculty Equity Associate, a position for which he emerged temporarily from retirement. Ellis was raised in Los Angeles and educated at Compton High School and UCLA where he gained significant recognition as an athlete before going on to become a scholar and professor of sociology. Ellis emphasized over the course of his interview that his is a California story that reflects this state's social history and diverse population. At Berkeley, he has worked to support and grow a student population that reflects this state's diversity. In this interview Professor Ellis reflects on UC Berkeley and the life and times that led him here. Significant themes include: a perspective on the University of California's institutional history from the vantage point of someone who worked for change from within the administration, a perspective on how and why affirmative action policies and programs were built and dismantled, gender and racial discrimination and academic culture, and curricular transformation catalyzed by the social movements of the 1960's. Professor Ellis' trajectory reflects that of a generation of African American scholars and professionals. For many in this cohort, athletic excellence and/or military service were the mechanics of mobility that allowed them to circumvent structural racism and gain access to formerly segregated institutions of higher education. 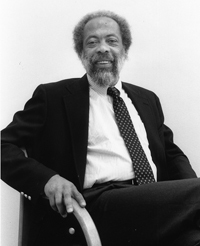 Against the changing backdrop of America's racial landscape during the ‘60s and ‘70s, Ellis and his peers leapt far beyond what had been possible for their parents and previous generations and were central in efforts to create mechanisms to increase access for minorities and women who followed them in the academy. Read "In the Golden Sandbox"